While I don’t often eat store-bought cookies, I do love to bake with them. 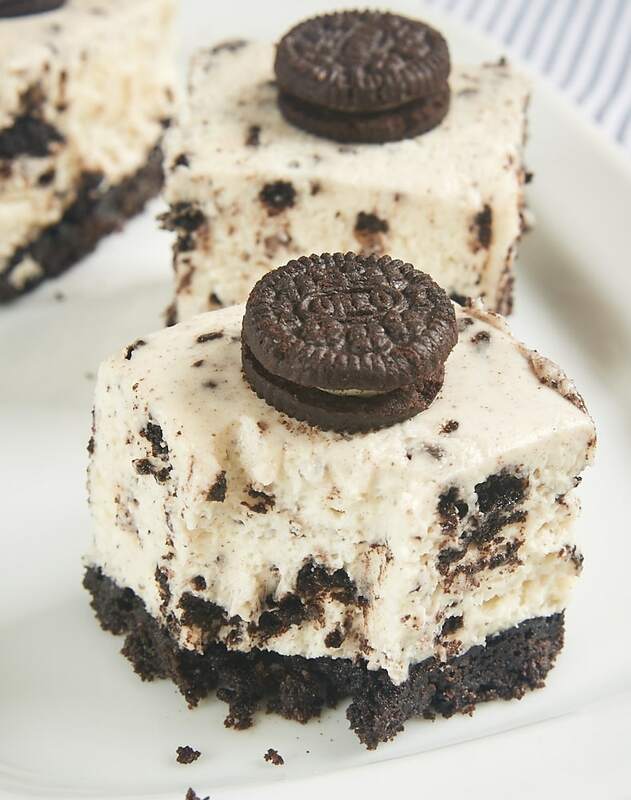 They’re great for simple cookie crusts or more significant uses like the Oreos in these fantastic cheesecake bars. Dessert doesn’t get much simpler than this. A simple cookie crust. 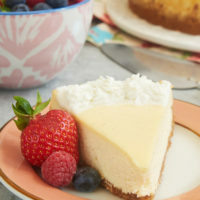 A no-bake cheesecake filling. Lots and lots of Oreos. This is winning, my friends. You can certainly serve these bars just as they are. 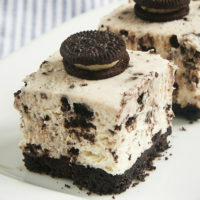 I couldn’t resist topping them with mini Oreos for a little garnish. 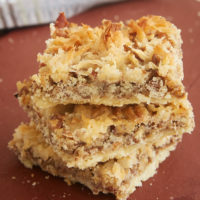 If you have leftover cookie crumbs, then you could also sprinkle those on top of the finished bars. For a little something different, you can also make this recipe as a pie or tart. You’ll need a 9-inch round pie or tart pan to do that. I just really like the idea of bars for a simpler presentation. They’re pretty irresistible, regardless of how you decide to make them. 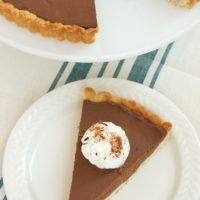 I included a no-bake alternative for the crust in the recipe for those times you just can’t bear to turn on the oven, even for a few minutes. The baked crust will hold up better, but that’s the only real difference. 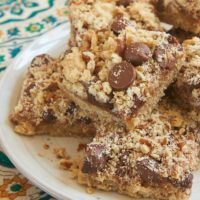 To put it simply, these cheesecake bars are delicious. 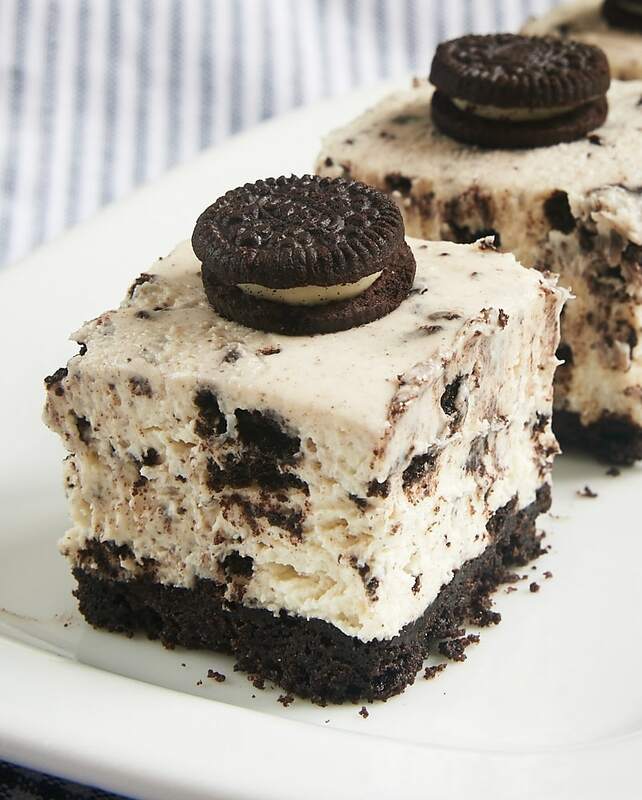 The big chocolate flavor and creamy filling of Oreos were just made for the cheesecake treatment. The taste reminds me a lot of a cookies and cream milkshake I used to get at a little drive-in in my hometown. 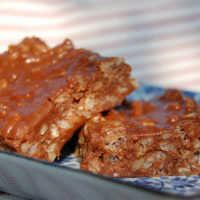 It’s thick and soft and creamy and full of big bites of dark chocolate cookies. Perfection! A cookie crust, a simple no-bake cheesecake, and lots of Oreos make these quick and easy bars a sure crowd-pleaser! Combine cookie crumbs and butter until thoroughly combined. Press the mixture evenly and firmly into the bottom of an 8-inch square pan. Bake 12 minutes. Set aside to cool completely. Using an electric mixer on medium speed, beat the cream cheese, sugar, and vanilla until thoroughly combined. Place the cream in a separate bowl. Use an electric mixer with a whisk attachment to whisk the cream to soft peaks. Gently fold the whipped cream into the cream cheese mixture. Gently stir in the chopped cookies. Spread the filling over the cooled crust. Refrigerate at least 4 hours before serving. *Briefly baking the crust will make a sturdier crust. But if you prefer, you can skip the baking time. After you press the crust into the pan, refrigerate or freeze it for about 30 minutes before filling it. I’m glad it was a success, Kay! This looks absolutely delicious. I’m planning to make it for my son’s birthday party. Enjoy! And happy birthday to your son! Thank you for the recipe! When you say, “7 ounces Oreo cookie crumbs (about 1 & 3/4 cups or 18 to 20 Oreos),” is that Oreos with the cream filling or just the cookie part? Thanks so much! Hi, Malia. I use the entire cookie, filling and all. I weighed out the cookie crumbs and the crust basically liquefied in the oven. Upon cooling it solidified into a sheet of chocolate cookie, very hard and not crumbly like yours. Is it possible that it’s more than 7 oz? The filling is great. I was so happy and pleasantly surprised that it wasn’t heavy or too sweet. I did use the Oreo thins as I didn’t want too much added sweetness. All great, just some issues with that crust for me. Thanks for another great recipe! Hi, Ellen. I’m sorry you had troubles! I double checked my notes from when I was working on the recipe, and the quantities are correct. I’ve never used Oreo thins, so I don’t know if there’s an appreciable difference in them versus the originals. It does sound like the crumbs to butter ratio was off for you, so I’d either cut down the butter or increase the crumbs. 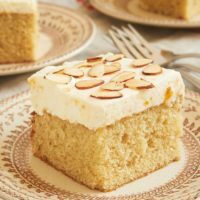 Could I double the recipe and use a 9 x 13 pan?